Eid ul-Fitr, Eid al-Fitr, Id-ul-Fitr, or Id al-Fitr (Arabic: ‎عيد الفطر ‘Īdu l-Fiṭr), often abbreviated to Eid, is a three-day Muslim holiday that symbols the end of Ramadan, the Islamic holy month of fasting (sawm). Eid is an Arabic word meaning "festivity," while Fiṭr means "original nature," implying the restoration of one's best human composition. 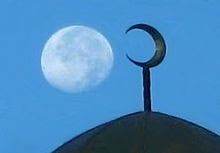 The holiday celebrates the conclusion of the thirty days of dawn-to-sunset fasting during the entire month of Ramadan. The first day of Eid, therefore, falls on the first day of the month Shawwal. Eid-ul-Fitr Salat (Namaz in Persian) is a Sunnah muak'kad (strongly recommended, just short of obligatory) or mandoob (preferable) – depending on which juristic opinion is followed – Islamic prayer consisting of two raka'ah (units) which is generally offered in an open field or large hall called an Eed-gah. 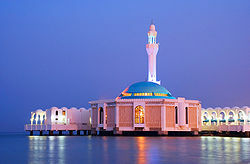 This salaat or prayer, can only be performed with Jama’at (i.e., in congregation) and has an additional extra six Takbirs (raising of the hands to the ears while saying Allahu Akbar (God is Great), three of them in the beginning of the first raka'ah and three of them just before ruku' in the second raka'ah in the Hanafi school. Muslims are commanded by God in the Qur'an to complete their fast until the last day of Ramadan and pay the Zakat al-fitr before doing the Eid prayer.